Administrative Building, Bay Street, Kingstown. St. Vincent and the Grenadines is an independent parliamentary democracy, and member of the Commonwealth of Nations. The State achieved independence on October 27, 1979. Our parliamentary and legislative systems are derived from the British model with fifteen (15) elected representatives and six (6) senators. These senators are appointed by the Governor General on the advice of the Prime Minister. The Parliament serves a maximum five year (5) term in office. However, the Prime Minister may call elections at any time. Queen Elizabeth II is the head of State (since February 6, 1952) and is represented on the island by a Governor General – currently His Excellency Sir Fredrick N. Ballantyne (since September 2, 2002). There are two dominant political parties on the island, the ruling Unity Labor Party (ULP) – under the leadership of the Hon. 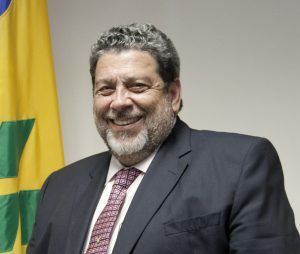 Dr Ralph E. Gonsalves (since 29th March 2001) – and the Opposition, the New Democratic Party (NDP) led by the Hon. Dr Godwin Friday. There is also the Green Party, led by Mr. Ivan O’Neil, and the Democratic Republican Party, under the leadership of Mrs. Anesia Baptiste. The Government of St. Vincent and the Grenadines is justifiably acknowledged regionally and internationally as a model of good governance. Our Government is open and transparent; and possesses a sound public and police service.